Birding: Ethiopia boasts close to 900 recorded bird species, over 30 of which are endemic to Ethiopia.﻿ EthioGuzo can provide you with the right itinerary for your birding needs and time frame. ﻿Wildlife: Ethiopia has a number of fascinating endemic mammals including the Ethiopian wolf, walia ibex and mountain nyala found nowhere else in the world. These are easily approachable if you travel to the right places. We know where to go for this and we'll take you there. ﻿﻿The Historic North: Explore the monasteries of Lake Tana, Fasiladas' castles of Gondar, the archeaological sites of Axum, the rock hewn churches of rural Tigray and of Lalibela, all dating back centuries in time. Cycling: Ethiopia has both paved and dirt road cycling opportunities. Cycling in Ethiopia gets you up close and personal with the people of rural Ethiopia. We offer both vehicle assisted and unassisted cycling tours. Fishing: There are fly and lake fishing opportunities in Ethiopia for those who wish to experience this activity in a unique and fascinating part of the world. 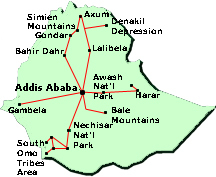 City Tours: We offer walking tours, visits to museums, markets, historical sites, art galleries and other interesting sites in and around Addis Ababa.